Located in Maryland's Allegheny Plateau, FireFly Farms began as a collaboration among a small group of neighbors who decided to enter the world of artisan cheesemaking. With a 130 acre farm purchased in 1997, the four "Fireflies" initially managed their own herd of goats. 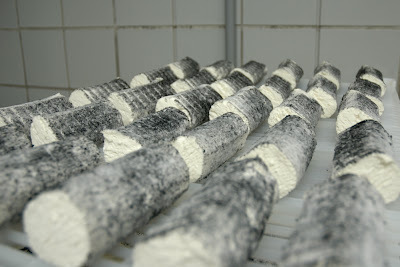 In 2006 they decided to focus all their efforts on cheesemaking. They now purchase milk from four local family farmers. The rich milk produced by Nubian goats is the secret to the rich flavors of there traditional goat milk cheeses. They have a clear, fresh taste and a soft, spreadable texture. Their website has the most beautiful image on the front page, which I have used above. There is also a terrific article and interview about FireFly, from Cheese by Hand.